1 dozen long stem assorted tropical flowers plus tropical foliage for only $57. 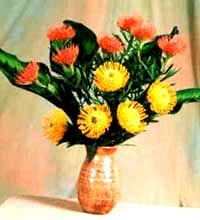 These are rare Protea Flowers only available from May to August. $54 and not arranged. A Goble's flower farm exclusive! Enjoy the smell of fresh cut Fresh "Silver Dollar" Eucalyptus without leaving your home. 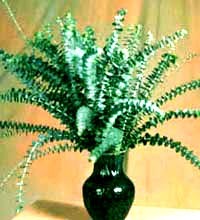 Two dozen branches from 14 to 24 inches long that will fill a room with the scent of the woods. Vase not included. 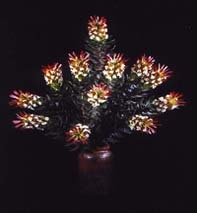 1 dozen Protea Pin Cushions plus foliage $39 plus shipping. Vibrant colors, lasts longer than roses.